Whether you soak in the sun or sit in air conditioned rooms all day, you’ll begin to feel the drying effects both environments have on your skin sooner or later. As in most cases, the best defense against dry skin is prevention. At Complexions, we have just what you need to keep hydrated through summer and all year long. Sweet Almond has long been known for its intensively conditioning properties. With holistic health and well-being being at the centerfold of all Kneipp products, it’s no surprise that the Almond Blossom range is rich in naturally-derived Sweet Almond and Jojoba oils. The restorative oils help nourish the skin and maintain its protective layers. Natural Sweet Almond, Sunflower and Jojoba Oils are taken up a notch with Vitamins A & E for total skin regeneration and protection. This restorative oil has a pleasant scent and absorbs quickly to offer intense re-hydration for even the driest of skin. The formula improves skin elasticity and leaves skin feeling soft and silky. Apply a thin layer any time of day, especially after showering, and gently massage into skin. This pleasantly scented, non-greasy body lotion absorbs quickly, leaving skin feeling soft and smooth. The Emollients, Sweet Almond, Avocado and Jojoba oils leave skin ultra-hydrated, especially when used after taking a shower, sauna, solarium or bath. This nutrient-rich body wash is a particularly useful remedy for very dry skin. The Sweet Almond Oil-infused cleanser it gentle enough for every day use, even for those who shower several times a day. Pour a quarter-sized amount into the palm of your hand and lather it into wet skin. Leave on for a few moments to fully experience the Almond Oil benefits before rinsing. 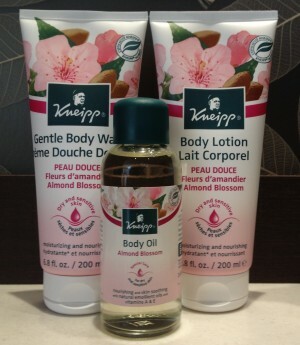 Follow with Almond Blossom Body Oil or Almond Blossom Body Lotion.